Last night I finally sat down and sketched out the ideas that had been in my head the last few weeks. It's rather unpleasant to have electronics and sewing notions and glue guns all mixed up together on one's brain, percolating for days on end, so it was nice to finally get everything categorized on paper. One of these ideas involves two light bulbs and a switch but for the life of me, I couldn't figure out how to get it to work the way I wanted. Yes, it was midnight, and my brain was already fried after a long day, but this is like elementary school Physics or something. Several ugly and unworking circuit diagrams later, I surrendered and went to bed with no self-esteem left. Something was just not clicking for me. So I'm asking for help - not a competition or giveaway or a game or symbiotic like that. Just an appeal to you clever folks out there who might know something I (clearly) don't. There are two light bulbs (red and green) and a gate that acts like a one-way switch. Action 2: When the gate is closed, only the red bulb lights up. Or at least that's what I want. Assumption 1: Both bulbs are identical so same resistance. Assumption 2: The gate switch S has negligible resistance. Outcome: Action 1 (the "green bulb lighting up") works fine, but Action 2 is a no-go. In theory, what's happening now with Action 2 is that when the gate-switch is closed, both bulbs light up, but dimmer. Bad. Today I got out my little box of circuit components and tried Action 2 out. Blast! Neither bulb lit up! Conclusions: Assumption 2 is false (very likely). Or else the batteries are weak (very likely, but I couldn't be bothered to find either new batteries or my multimeter (husband took it) to test them out. Is Action 2 even possible with 2 AA batteries (1.5 V each) and 2.2V bulbs and a garden-variety switch? I heavily suspect that, all other resistances being very small, I need a biggish resistor at point X. Is this true? I was trying to avoid this because I don't own any resistors, color-banded or otherwise. Assuming I need a resistor, does anyone know how to make a resistor out of household stuff, like (but not limited to) lemons, foil, candy, old bits of banana peel, dryer lint, diapers, toilet paper, nutella? I can offer my rescuer nothing except my undying gratitude and a promise to share this foolish, foolish project when if it is finally made. Thank you. Thank you. On a brighter note, today was not a totally wasted afternoon - the girls discovered me tinkering with my circuit stuff and insisted on joining in. Apparently mum's toys were funner than theirs. So we spent several hours playing with LEDs, magnets and alligator clips and ducking into dark bathrooms to ooh and aah at optic fibers lighting up. Even with having to stop Kate grabbing wires and things, we had fun. P.S. Sorry, sewing fans. This is not a sewing post. Sewing drives me nuts sometimes. So I dabble in electronics. You? I'm Kitten Muffin's other half. You can get switches which have 3 leads on them (most of the ones I've collected seem to be built this way). If you've got one of these, then it's really simple to connect up the bulbs as you described. The middle lead is common to both bulbs (that'd be the negative lead in your diagram) and each bulb would be connected to one of the other leads. et voila. As for your conundrum, when performing action 2 neither bulb is powered as there's insufficient voltage (well, that's what it seems like to me). My sweet hubby will show it to engineer friends, if you can wait. However, they might soup it up a little, lol...one can never have too many lights, batteries or switches. Can't help, but I am intrigued! Yikes, I failed the electricity portion of physics, but I did get an awesome husband out of the class so all is well in the world. Best of luck with your project! My eyes glazed over when I saw the words "circuit diagram..." Sorry, you lost me! You're a renaissance woman, that's for sure. Can't wait to see what this is all about. Without adding components get a three position switch. A on, off, B on. That is the easiest way to do it. Radio Shack has mini switches for that. Thank you, Paul and Shawn! Am off to Radio Shack tomorrow or the weekend, then! 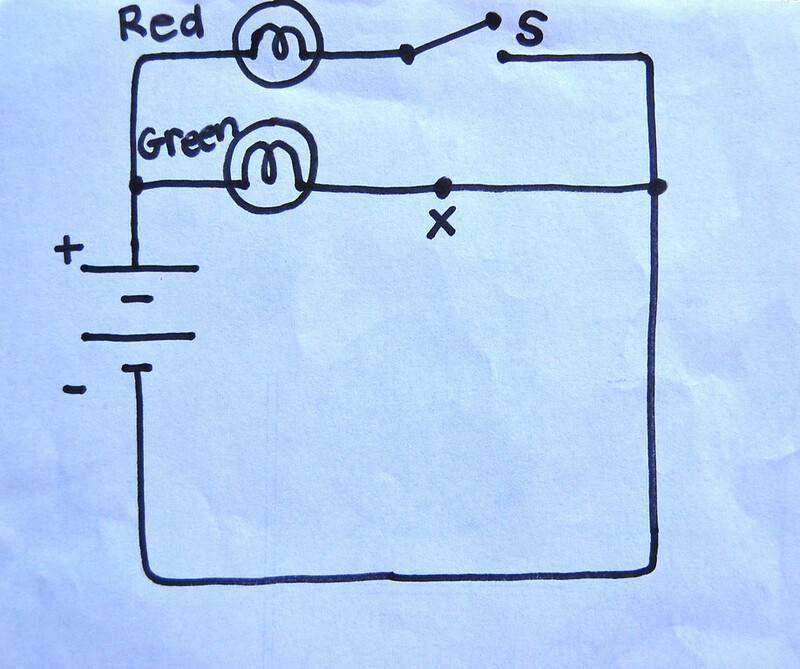 Right now, the Green circuit is complete. Period. This light should remain lit no matter what you do with the Red circuit. If you want it to turn off when the red light turns on, you need to break the Green circuit when you complete the Red one.